he total area of vineyards in the north-west of the United States is small, certainly when compared to the sprawling expanses of California, but is nevertheless spread across a vast geographical area. Pinot Noir, Pinot Gris, Pinot Blanc and Chardonnay have now been well-established in Oregon for close to three decades. A whole host of small to medium-sized wineries have emerged and new ones continue to do so. Most of these are to be found in the Willamette Valley. Washington State is the second largest state in terms of quality wine production behind California, but has only recently become really well-known. New and exciting sources of top reds, from both the Bordeaux and more recently the Rhône varieties, are increasing and it seems certain that this trend will continue. As well as the Willamette Valley there are several other AVAs to the south, including the Umpqua Valley, Red Hills Douglas County and in the far south of the state Rogue Valley and Applegate Valley. 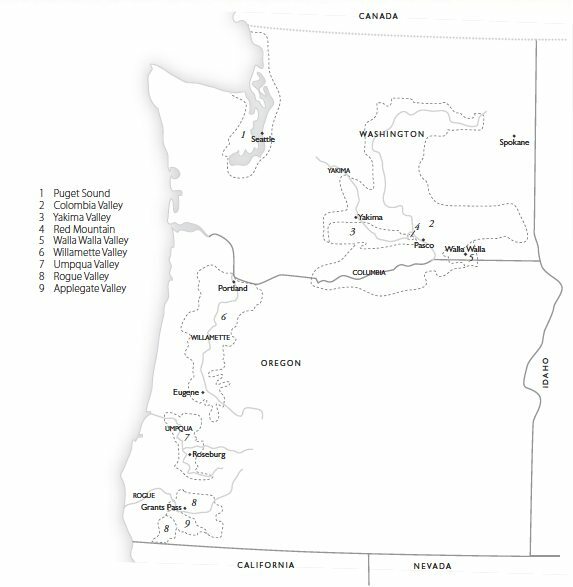 The southern appellations are also now included in a generic Southern Oregon AVA. The Umpqua Valley region sits in the river valley of the same name, with coastal ranges to the west and the Cascades range of volcanic peaks to the east. Some exciting reds and whites are emerging. The Rogue Valley is marked by relatively high-altitude vineyards and cool-climate whites, including Gewürztraminer and Pinot Gris, are planted with some success in the westerly sectors of the AVA, as are increasingly impressive reds. In the north-east both the Columbia and Walla Walla valley AVAs extend over the state line, with a few wineries based on the Oregon side. The Columbia Gorge further west also straddles the two States. 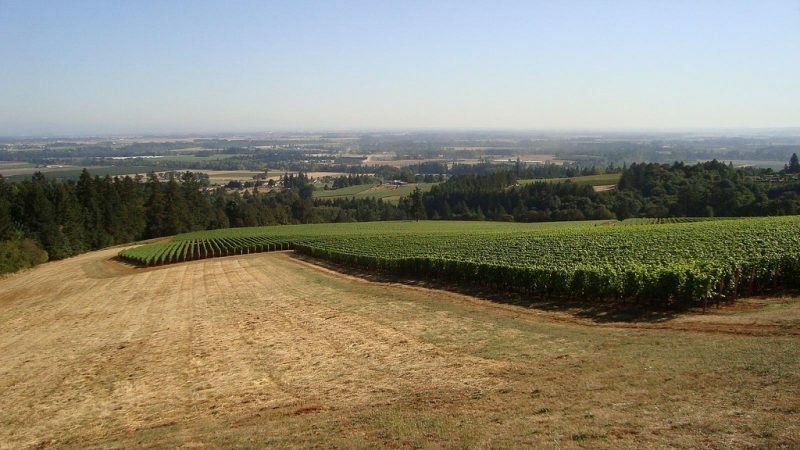 The main viticultural activity, though, is in the Willamette Valley, a vast stretch of vineyards with varied soils and an extensive array of mesoclimates running from Eugene in the south to Portland in the north. At its widest the AVA is in excess of 80 km (50 miles) and it runs north-south for 320 km (200 miles). The majority of vineyards are found in the northern half of the region between Monmouth and Portland; the greatest concentration in Yamhill County, in the centre of that area. Here six new smaller AVAs have been established. These are the north-western Yamhill-Carlton District, to its east the Chehalem Mountains which includes the Ribbon Ridge appellation and stretches the furthest north. Immediately south the Dundee Hills and to the south-west McMinnville. The most southerly of the sub AVAs are the Eola-Amity Hills. This is mainly Pinot Noir country and the hunt for unique sites continues apace as wineries seek to establish different terroirs. Because of the small agricultural nature of the industry there is a real air of co-operation. Many producers are now farming biodynamically or sustainably. A number of white varieties are also successful, among which Pinot Gris and Pinot Blanc have the best potential. Inevitably Chardonnay is extensively planted but really striking examples are still limited. The vineyard area here is vast and is dominated by the giant Columbia Valley AVA, within which there are three sub-AVAs, the Yakima Valley in the west, the Horse Heaven Hills that borders it and the Walla Walla Valley in the east. A sizeable part of both Columbia Valley and Walla Walla in fact stretches into northern Oregon. The Yakima Valley also includes three further sub-regions: Red Mountain, Rattlesnake Hills and most recently Snipes Mountain. A newly established AVA close to the coast is Puget Sound, yet it appears to be too cool and damp to provide wines of any substance. The Columbia Valley by contrast is dry and necessarily irrigated. Located to the east of the Cascade Mountains, it is suitable for quality wine because of its northerly latitude and consequently longer, sunnier days. Excellent Bordeaux-style reds are produced along with good Chardonnay. The Yakima Valley is also successful with these grapes and with Syrah. Perhaps the greatest potential is actually for the Rhône varieties rather than those of Bordeaux. Excellent wines of both styles have now been made in Walla Walla as well.